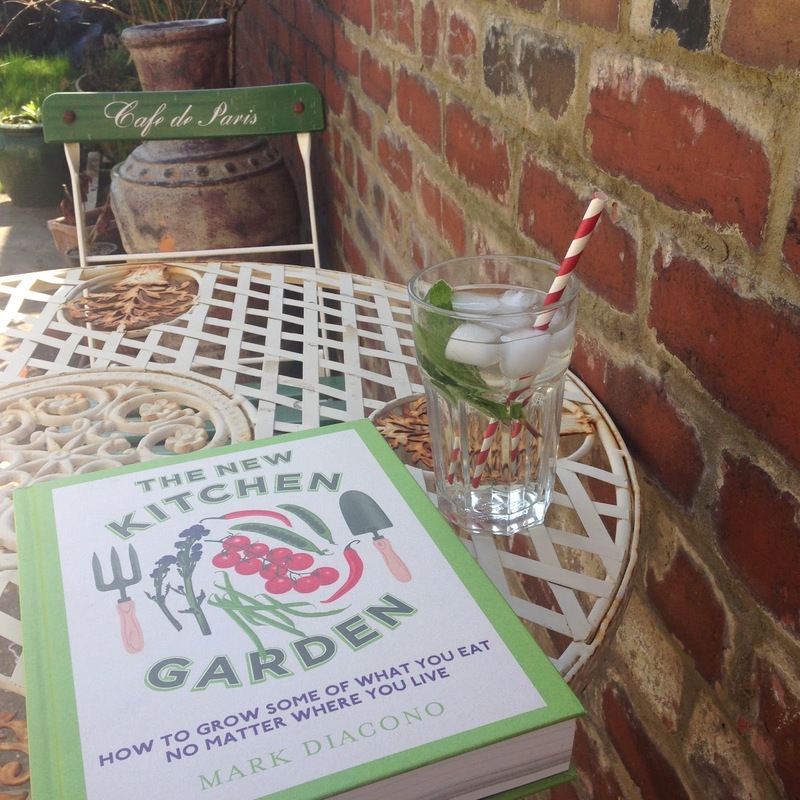 Last week was National Gardening Week and for me it meant spending time with a few new books and working out a few more things in our garden. I thought I'd tell you about our garden and the plans we have started to make for our space. There's lots of work to do but as you can see we have removed a lot of plants that were filling up a space within the garden and have created the space for raised beds. Before we made the changes Mr C and I thought about what we wanted the space to be used for. I knew that I wanted to have raised beds to grow herbs, vegetables and cut flowers but there were also a number of other things I wanted to consider and be part of the garden project. Grow our own - there's nothing better than cooking with freshly picked herbs added to a dish. Home grown carrots and potatoes with butter and herbs are just delicious. Picking salad leaves, giving them a wash and creating a delicious lunch is something I got huge pleasure from in our last courtyard garden. I don't expect our garden to replace all of our food shopping but I hope it will help in a few areas and will teach us even more about seasonal cooking and growing our own. Be a space to relax and entertain in - I love entertaining friends and as Mr C has a huge passion for cooking what better way to combine using an outside space for growing as well as entertaining. I envisage summer evenings with tea lights in jam jars, the chiminea or bbq providing heat when the sun is setting, daytime lunches with pretty napkins and big platters of home grown salad to share, and a space we want to sit in and enjoy. Reduce the impact on the environment - For us it's important to consider where our food comes from. We regularly shop at farmers markets, our local independent shops, and will go to supermarkets for a number of things, but we do our best to buy what is in season and as much as we can buy food grown in the UK. I would love to reduce our reliance on things that can easily be grown at home, for example rocket, lettuce and herbs that we regularly use. It means we buy less and have less packaging to recycle. Help nature - We want to attract and encourage wildlife as much as we can into our little space in the city. In time we will add bird feeders, a bird box and a bee house/hotel and think carefully about the flowers we grow. At the moment a bee hive isn't really an option but something I would've loved to have done if we had a flat roof space. Grow a cut flower patch - I adore having cut flowers in our home but it upsets me when you realise the distance the flowers have travelled to make it into our homes. I try to buy British where I can but from time to time I do buy from supermarkets where the flowers have been flown a long distance. I would prefer to have home grown seasonal flowers in our home instead, it's a little mission I have. Plus how lovely would it be to visit a friend with a small posy of home grown flowers tied together with a little piece of garden twine or ribbon as a gift! Create a cycle - I'm keen to find out more about how to recycle our garden waste and home waste. As we plan our space we are thinking about whether we can have a compost heap or wormery. Creating our own plant fertiliser will mean less waste will be taken away to be recycled by the council. I've still got a lot of reading to do on this but I hope that later this year we will be able to set up one of the options. Reduce urban run off and conserve more water - As we will be changing the use of the garden space quite dramatically, I have on my mind the impact it may have to the ever increasing problem of urban runoff. We are planning to take out the lawn, add pebbles and stepping stones/path to the end of the garden, and grow more things in containers where our lawn once was. Our garden design will plan to reduce urban run off by having hanging baskets, more containers on patio spaces to absorb the rain, more water butts storing excess water from the house roof and plant more plants to slow urban run off. Include reclaimed or sustainably sourced materials where possible - Mr C and I have started building raised beds over the past week from recycled scaffolding planks (I'll show you soon!) and have used wood from a wood recycling project in the city. We are planning to remove the lawn and will use this upturned into the raised beds with compost being added on top. To fill the raised beds we are planning to use the existing compost heap as well as compost from Mr C's family farm. I hope to only need to buy peat-free soil as and when we need it, but I am aware we need to get our soil ready for the best growing conditions we can and this year may mean investing in more soil. Where our budget will allow I want to make sure that the materials we select are sustainable and I look into where the materials come from, or recycle and make our own. Be a space to escape in - Over the years I've been gardening I've found that it is an incredible form of therapy. When I've had lots on my mind being able to escape into our outside space, dig, sort and tend plants has given me a fresh purpose and a real focus. I want to continue that in this space and see our garden as something we are very much responsible for, that is an attractive space to escape to and enables me to continually learn about growing seasonally. I'd like to create a mini haven in the city that I can sit in and enjoy. I hope that this gives you a little insight into what we are planning to do with our space. I'm off now to continue reading my gardening books and researching greenhouses! I'll be back soon with an update on our raised beds and what the garden is looking like at the moment. Enjoy the sunshine and enjoy your outside space, whatever size it may be.